It's high August and the peak of summer produce. It's also just plain hot. I really detest cooking in this weather, but what I do enjoy is the cold, fresh snap of a pickle--and I'm willing to do a little work to turn the bounty of cucumbers and tomatoes, radishes and squash and beans into something tangy and sour. 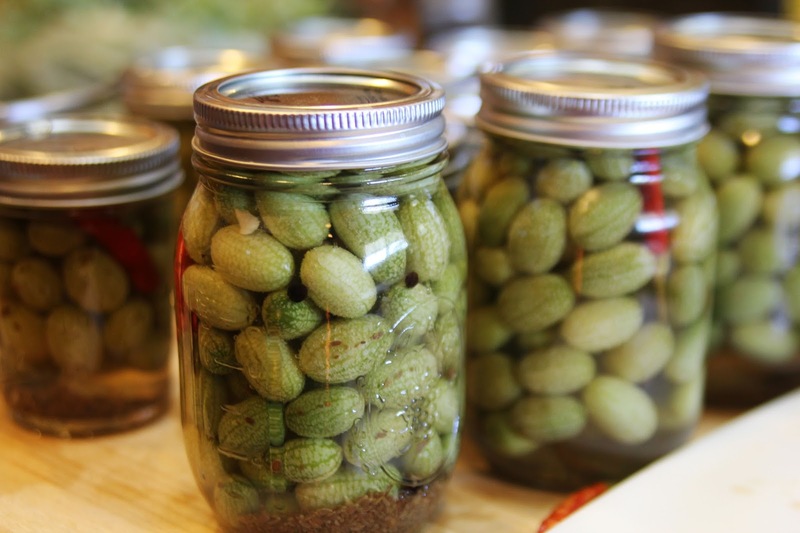 Over the almost 10 years I've been writing San Diego Foodstuff I've written a lot about pickling. I've made quick pickles with the Balistreris of Tender Greens. I've made my Nana Tillie's dill pickles. There are the pickled beets I made for my dad and my favorite pickled marinated eggplant from the late, beloved Gourmet magazine. Read on for links to all these recipes and more. Bread and Butter Pickles: I've been making these pickles for my dad for years now. It began when I learned how to make bread and butter pickles from Quality Social's Jared Van Camp and Sam Burman. My first batches went to Dad -- long called "Opopie" by my nieces and nephews -- as a birthday gift. He asked for more. Then I developed my own version, combining Jared's recipe with the traditional Ball recipe from The Ball Complete Book of Home Preserving, which has what I believe are the best instructions on how to do the much-dreaded water bath. Follow them religiously and you'll find it's actually a breeze. Quality Social's Natural Pickles: Here's where I started getting my pickle chops. Charcuterie is matched perfectly with pickles. The acid from the pickles complements the fat of the sausages. 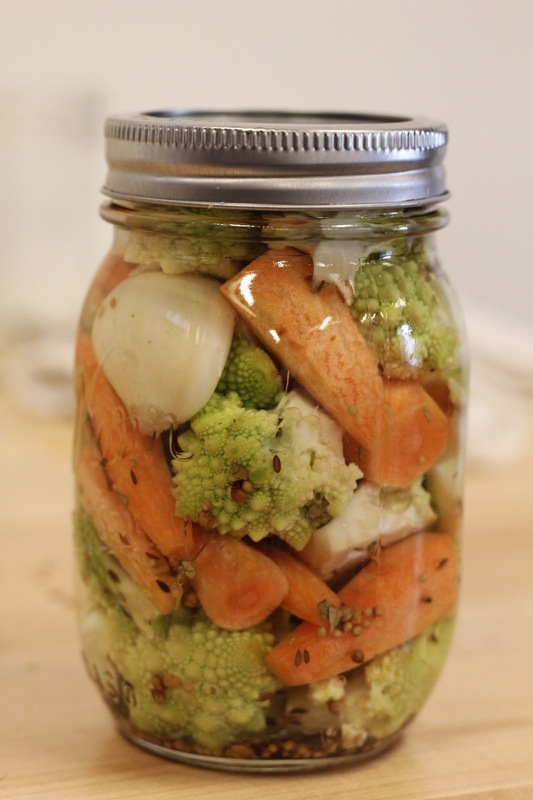 With this recipe you can pickle just about any vegetable and, again, it's so easy! 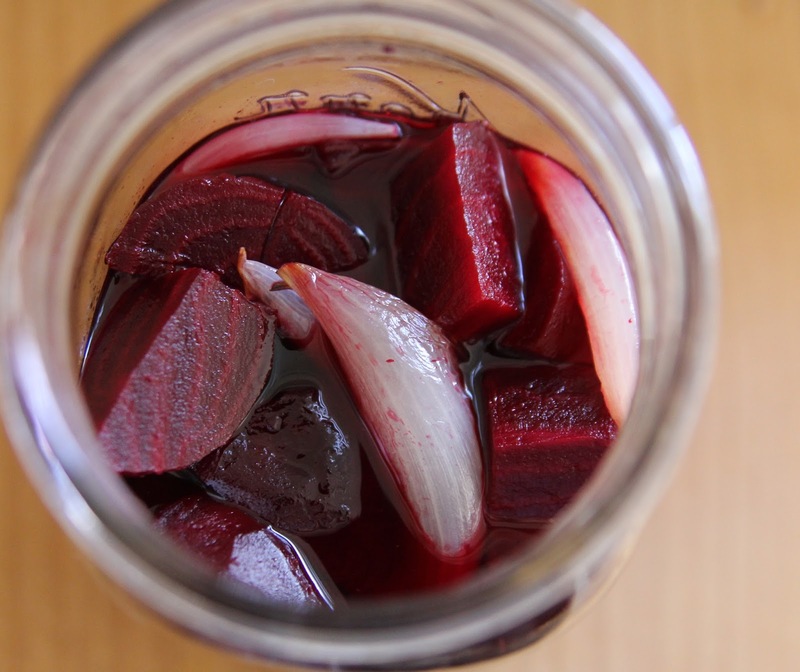 Pickled Beets with Shallots: I made these for my dad just one year ago. As my friends know, I detest beets--so this was truly an act of love. But I have it on good authority that they're delicious. My dad went through jars of them in no time. 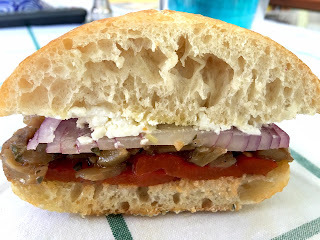 Italian Marinated Eggplant: This is my favorite eggplant recipe. I discovered it in Gourmet a zillion years ago and it's almost always in my fridge. 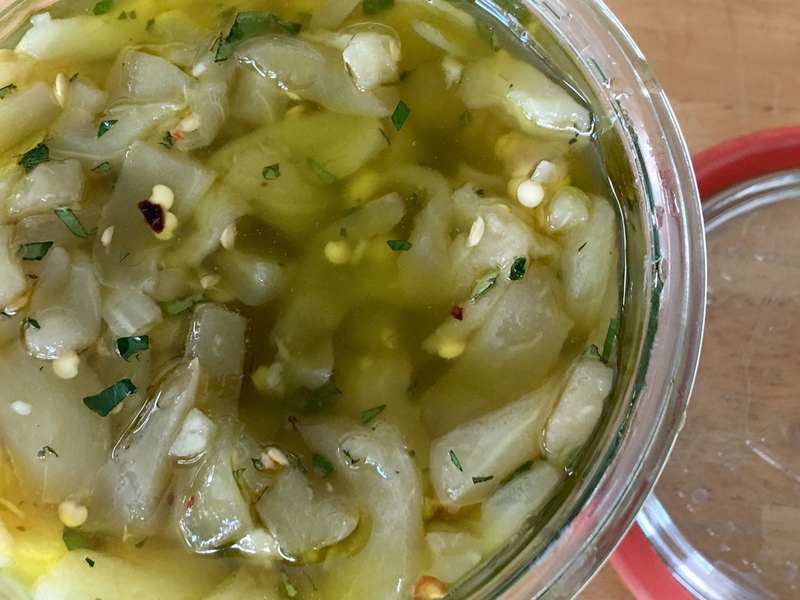 It starts out as a pickle and goes on to be marinated in olive oil and garlic to become the perfect snack or appetizer. The actual prep doesn't take long but it's a day-long process as the eggplant is salted and then cured. Oh so good on sourdough rolls and the basis of this, my fave sandwich. Quick Pickles: Looking for a quick and easy pickle to make? I have three recipes for you here from Pete Balistreri and his cousin Pete Balistreri of Tender Greens. 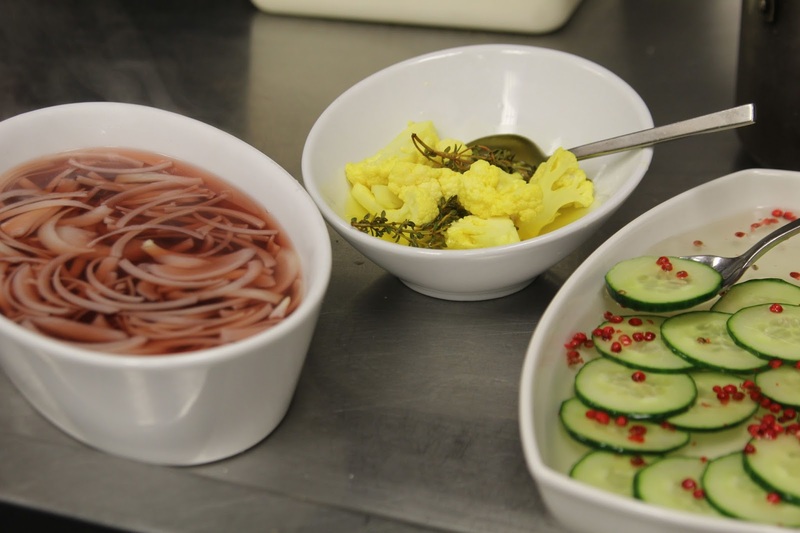 There's their Asian-Style pickle with rice wine vinegar and sliced cucumbers, their pickled onions featuring red wine and red wine vinegar, and pickled cauliflower made with thyme, turmeric, and champagne vinegar. Pickled Watermelon Gherkins: These little cukes look like miniature watermelons and when pickled, are divine! A few years ago I got kitchen time with Chef Kelli Crosson of The Lodge at Torrey Pines and together we made a batch of her pickles to jar for the upcoming Celebrate the Craft. I also coveted the funnel she used to distribute the brine--and, lucky me, was gifted with one by a friend later. It's a treasured kitchen tool. Dill Pickles: My siblings, cousins, and I have sensory memory of these pickles our Nana used to make. When we visited her at her apartment near the Santa Anita Racetrack in Arcadia, jars of these would be out on her porch taking in the summer sun. When we ate them, the brine would dribble down our chins and we'd all smell like garlicky dill pickles in the heat of the car on the way home. But we'd be happy. These are easy to put together, as you'll see. 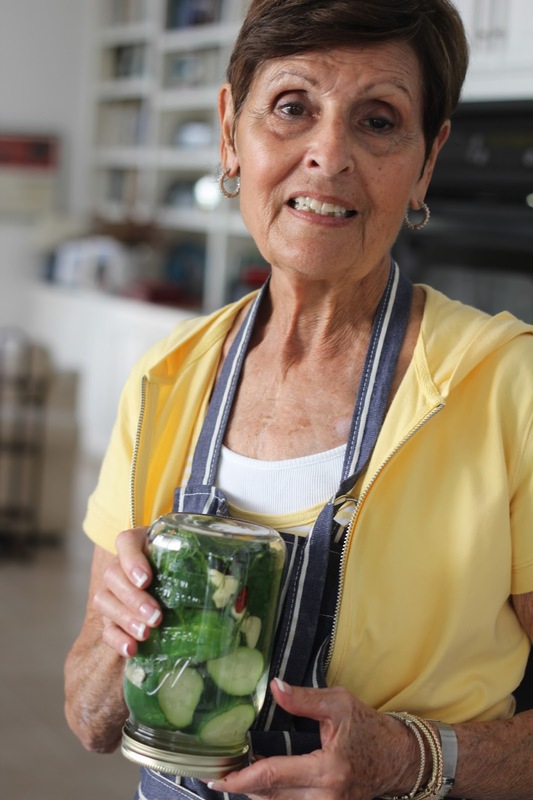 Here's my mom holding a jar after we made a batch awhile back. 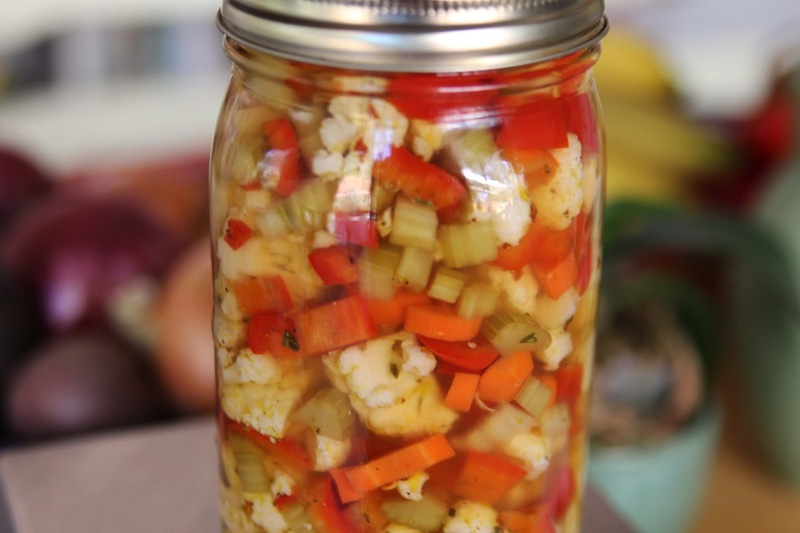 Crunchy Giardiniera: Jenn Felmley is responsible for this recipe, a simple giardiniera that is heavenly in a sandwich. Mix together the vegetables you prefer. I like peppers, cauliflower, carrots, and celery for a more traditional approach.